Some other exploration from the weekend- Blowout Blue. Forrest Wilson arrived early, and dug some gravel out of the entrance. I got in a couple of hours later and started surveying- Cleaning up the 466 feet from Matt Vinzant. As I finished this and started tying off a new reel, Terry Hall arrived, so he got the reel, and I surveyed behind him another 635 feet. As he finished this reel, I took over, and laid an additional 469 feet, and surveyed back out. Total of 1748 feet with a max depth of 75 feet. Starve Rock cave is a low cave on private property that was in danger of being damaged by nearby TDOT road construction. We mapped the cave and counted bats, finding it to be a maternity cave, which we reported to USFW. The road construction project was adjusted, and the cave was saved. 915 feet of cave were mapped. Kaven Spring, Jackson County, TN. Jason checking out the spring- to see if there is anything at all. 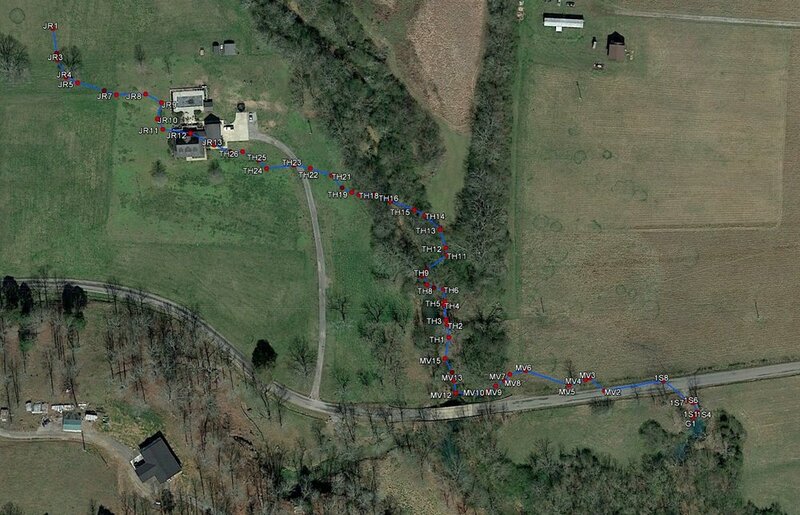 After doing a short dive at The Boils, a large spring coming through road fill in Jackson County, TN, a local caver, Amanda Pigg asked if Anne Elmore and I would like to take a look at another nearby Jackson County Spring. We hadn’t heard of anything else in Jackson county, but the dive gear was already wet, so why not? 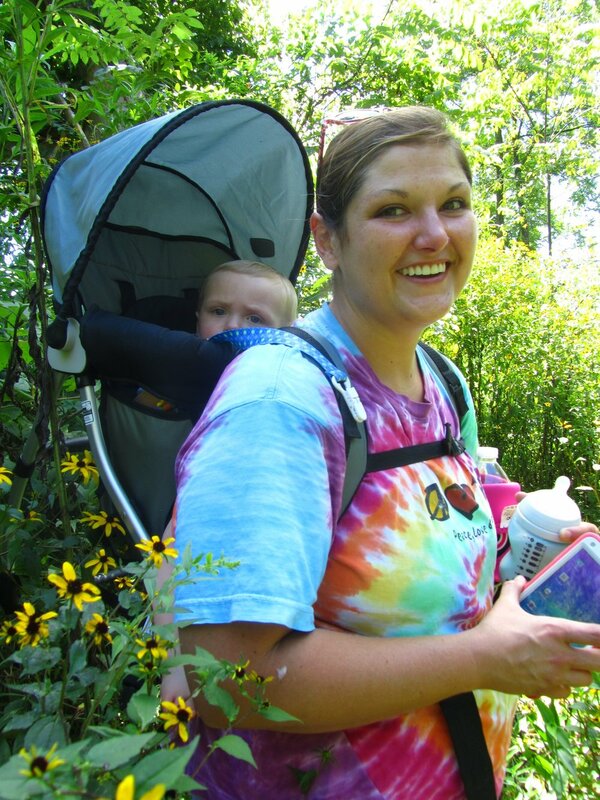 Amanda proceeded to race down backcountry roads across Jackson County, eventually stopping near a bridge across the Blackburn River where we got out of the vehicles and she strapped her young boy Kaven (pronounced like “cabin” with a “v”) into his kiddie backpack for a little walk. Though there was not really obvious evidence of a spring head here, she announced that it was a short walk and we would have to bushwack through the high grasses and weeds. A pleasant 200 feet later we all stood on a low bank overlooking a 20 foot wide spring pool with two visible spring vents- one about a foot in diameter close to the western edge of the pool, and a second one, a low ledge about four feet underwater that appeared to have some small rocks laying up against it, under a bright green blanket of filamentous algae. The first entrance was obviously too small, I could stand on the edge of it and see that it was dropping down about two feet deep, but then had a rocky floor where it narrowed into a fissure. The lower entrance looked more interesting. I thought that there might be a chance to move some of the rocks and possibly make a passable entrance. Moving some rocks and putting them up on the shelf. Not one for moving tanks a long distance through the woods, we backed the vehicle up a little closer to the spring and unloaded the sump diving tanks and gear into the water. The sump gear is a little different than normal cave diving gear- it requires much smaller tanks, in this case steel 50 cubic foot tanks, which are worn along the side of the body. There is no buoyancy compensator, or jacket- only the drysuit can be used to add additional buoyancy. And finally the weight belt. Not just a belt around the waist, but a whole harness with weight distributed across the shoulders as well, which takes the place of the attachment points normally found on a buoyancy compensator. Of course the usual complement of three light sources, and a reel of cave diving line, for finding your way back out, should the visibility drop to zero. And last, but not least, the underwater survey book for documenting anything that might be found. Once in the water, I started moving rocks. A lot of rocks. It was difficult to tell if rocks had been stacked in front of the entrance intentionally, which I suspect might be the case, or if they just happened to be there. Regardless, after twenty minutes of moving rocks out of the way, the lower entrance was starting to look passable. The opening had cleared up to expose a narrow bedding plane slot, about 8 inches high and 30 inches wide. I don’t really like going head first into something this small, on the off chance that a piece of gear might get hung, and you would be stuck head down in a very small hole, so I slipped my fins backward into the slot. I had seen that there was a larger space just beyond the bedding plane squeeze, but it was difficult to see how large it was. I wriggled my fins back into the cave, then my knees, and my thighs, but stuck at my hips. Small pieces of cobble, which made up the shallow slope leading into the cave were getting wedged between my hip bones and the bedrock bedding plane. After shoveling some more of the cobble, and trying to reduce the angle of the slope in front of the entrance, I was able to get my hips and waist through the bedding plane. This was going really well! I finally wriggled back far enough for my chest to start into the crevice where I stopped fast. My inflator on my drysuit added just enough thickness that I couldn’t back any further into the bedding plane. I pulled myself out of the cave a foot or so, and dug some more on the little cobbles- hoping that I could clear a path for my drysuit inflator. After another five minutes of gravel shaping, I tried again to back down into the narrow slot, and with a little exhalation, popped through the narrowest spot. This was my first proper view of the cave, and as I swung my large cave diving light around, I was amazed to see a decent sized passage heading off to the west. It’s hard to say if everything looks bigger and feels happier after squeezing through such a tight place, but I was certainly enjoying the size of the passage, about four and a half feet wide and five feet tall. The water was crystal clear, fading off to deep blue in the distance, and each little piece of tan limestone on the floor was coated with a filigree of fine chert. The floor was a nicely scalloped small gravel interspersed with hand sized chert nodues, indicating that the cave had periods of high flow, but today, it was lazily moving water past me. I began a slow swim down the passage, unwinding my diving line behind me, occasionally wrapping it around small protrusions along the floor, making a solid pathway for me on the way out. The depth was slowly increasing, from four feet at the entrance working its way deeper. This is always a good sign, as most underwater spring caves do not stay shallow in Tennessee, though I had never been in one in Jackson County. As I continued down the passage, I came to a place, after about 200 feet, I came to the first split in the passage. I tie my line around a small bulge on the right side, and decided to try the right passage first. It looked smaller, but it was also solid rock on both sides, instead of silty. Less chance that I would make a mess of the visibility, should I have to turn right around. I squeezed between the chert ledges on the walls, turning sideways to fit between the narrow spots, and was able to progress about a body length before the cave would no longer allow me to pass. I was able to see that it appeared that the passage might end, or at least drop into a very small hand sized passage along the floor, from which the water was issuing. I backed out, reeling up my line, and returned to my last tie off. Looking left, I took a long look at the second passage. It was quite a bit wider- almost 12 feet, but lower- it looked as if a slab of the ceiling had fallen, and the passage continued over the slab, but very low, and there was a deep layer of fine silt on top of the breakdown. Some decisions had to be made. I could likely get through the passage over the breakdown, and it appeared that it might drop down again after about 15 feet on the other side of the breakdown slab, but I would definitely reduce the visibility to zero, as I would have to slide through that silt layer on top. Also, the presence of the silt layer also meant that this area had lower flow normally, which doesn’t usually mean there will be more passage on the other side. It was possible that most of the flow normally came through the narrow passage on the right. In addition, as this was my second dive of the day, my tanks were only half full at the start of the dive, leaving me much less gas to deal with any contingencies, even though I had not yet reached the first third of my gas allowed for the dive. (Cave divers use 1/3 of their gas for entry, 1/3 of their gas for exit, and leave 1/3 for emergencies.) Knowing that coming out of the restriction at the entrance might be more difficult than coming in also weighed on my mind. With enough things on the against tally, I made a final tie off of my diving line, and added a line arrow with my name on it, to indicate the exit direction, and dug out my survey book. With the cave as explored as it was going to get for the day, it was time to “do the hard part” as Gerald Moni would say, and collect the data. In a few short minutes, I was back at the entrance of the cave, looking out at the narrow restriction, with the light streaming into the cave, and a myriad of small, very colorful fish swimming about. I took some time to look at the fish, as I had never seen that many colors of fish outside of freshwater pools in Mexico, it looked as if someone had dumped their freshwater fish tanks full of cichlids in the spring. The fish were plenty friendly, and very interested in my light, as they swam about my mask and bumped their noses into the bright light. Soon it was time to start on the squeeze to get out of the cave. I anticipated it being tight, but as I got my chest started into the restriction, I was getting hung up. The ledge that made the bedding plane and vertical portion on the inside of the cave that was hanging my gear, where it had not done so going the other direction. I tried a bit more, exhaling, wriggling, and every time, the blocks of weight on my harness would catch on the narrow ledge. I inched back into the cave to see what might be the problem. I shoveled a little more cobble through the bedding plane into the cave, and tried that, but still the same issue. I could get just far enough to get my face out of the cave, but no further. Finally I decided that though my tanks were not thicker than my body, the right side of the crevice was slightly larger, and by getting closer to that side, I might be able to squeeze through. I removed my right tank, and swung it forward out of the cave, holding onto the valve so it would not escape from me. I slid a couple inches to the right, and with a little exhale, and a lot of shoving against the slope of cobble, was able to inch my way out to my hips, where I finally broke free of the narrow bedding plane. The fish were sad to see me go, as they quickly scattered back towards the entrance while I slowly swam my way to the edge of the pool, to let everyone know about the discovery. The final data indicated 205 feet of passage, with a max depth of 23 feet, generally trending north under the Blackburn River. So far, the deepest and longest underwater cave in Jackson County, though a far cry from either of those milestones in Tennessee as a whole. The cave's namesake- hiding out in his backpack. Located directly over the top of Cow Crap Cave, this sink was thought to have connected to the cave system, more than 10,000 feet upstream from the main entrance, but unfortunately has been plugged by trees and debris falling into the sink. 298 feet of passage were explored and surveyed. Jason ready to dive after rappelling into the sink. Pattons Spring Cave is a short cave in the front yard of a Rutherford County landowner. It has two entrances, but the upstream pinches in a gravel slide. No map has yet been published. 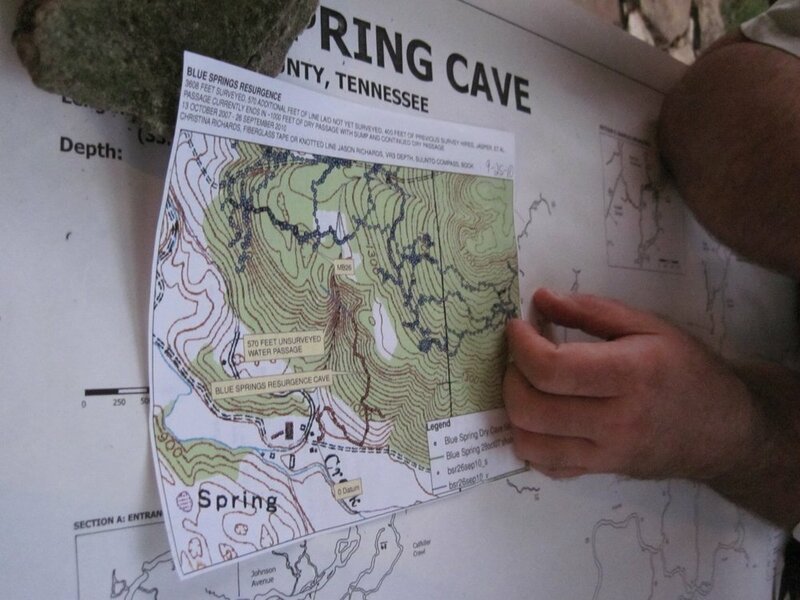 Blue Spring Cave in White County is the longest cave in Tennessee, over 38 miles and still increasing. For four years (2006-2010) I collected all of the 20 plus years of sketches and collated them into one mapbook. The mapbook underwent one printing of 200 copies, all of which were sold or donated to explorers. The project started with Chrissy, Marbry Hardin and myself diving the spring pool in the landowner Lonnie Carr's back yard. After 5500 feet of underwater passage, 1200 feet of dry passage, and three sumps, we finally connected to the main cave. Jason with Lonnie Carr (R) landowner, and Bill Walter (L) Lead Explorer and surveyor for more than 20 years. An Advertisement to view the full map at the NSS Convention. Boomshaw is a Tennessee word for "pit filled with water." There are numerous boomshaws in middle Tenneessee, and the main entrance for this system is directly in the front of the landowner's house. After connecting to a downstream sink, this has the potential to be a multi-mile underwater system, if the water would ever clear. Currently there is slightly over 5000 feet of explored passage, and is the second deepest underwater cave in Tennessee at 168 feet deep. Jason, after a successful dive in the downstream side of the system. The Upstream entrance in very low water, the best diving. Diving immediately after a huge rain (the same one that caused the nashville flood)- the water was rising as the dive was going on, and the outflow went from none to very heavy during the dive and the visibility dropped to this correspondingly. Chrissy looks into the downstream. 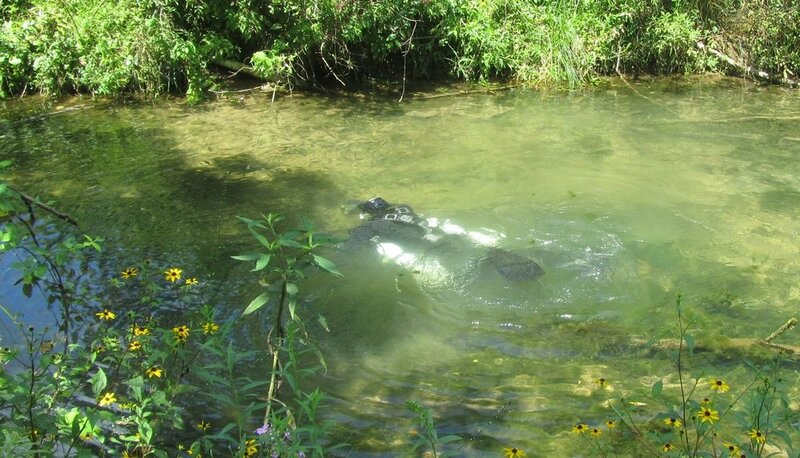 Cow Crap is the second longest underwater cave in Tennessee (behind Jasper Blue Spring.) Starting at the Cow Sink entrance, it goes downstream to Military Spring, and upstream more than 10,600 feet underneath Green Man Sink, which at one time it connected to. Access is temporarily suspended while the property ownership is changed. Jason and Chrissy at Cow Crap in good conditions! 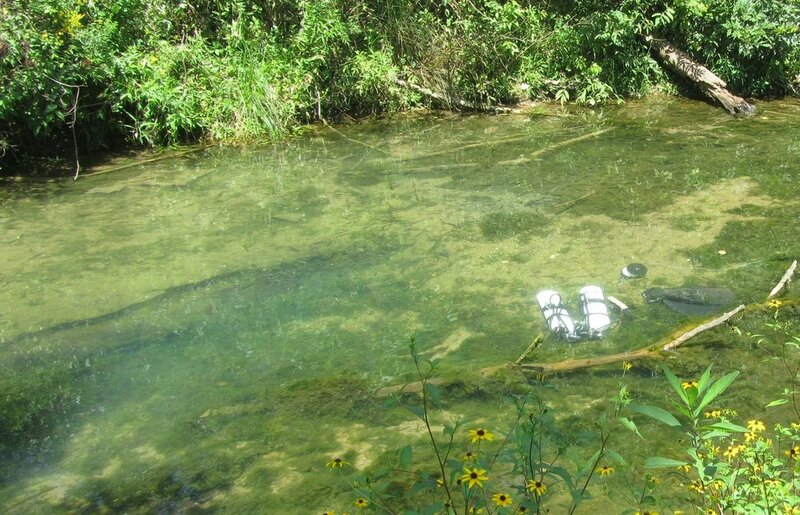 Drought may not be good for crops in Tennessee, but it sure is good for Cave Diving. We have been exploring and surveying the Cow Crap Cave System for more than a year and a half, and in that time have only managed 5 survey dives, where the conditions where good enough that we could see more than a few feet in the cave. This year, in 2012, Tennesse is beset with record temperatures and record low rainfall, setting the perfect conditions for diving at Cow Crap. The system is normally shallow, predominantly in the Ridley limestone, 50-60 feet below the generally flat corn fields and highways above. The entrances have been dye traced to other sinks in the area, and the whole system is believed to drain a very large area through multiple surface infeeders. This shallow and rapid recharge means that the system is impacted by every small thundershower that crosses the recharge area, and good visibility one day may be, and frequently is, gone the next. The main entry point, MTSU Karst Window, is true to its name and has a spring and siphon passage entrance on either side of a typically greenish pool. The water level can vary as much as 20 vertical feet at the karst window- During wet seasons, the water level is high in the trees, with millions of gallons of surface drainage flowing through the karst window. In diving season, the water level drops to expose limestone bluffs all around the sinkhole, and eventually exposes an old wooden fence which once divided the sink, buried in the sand bottom of the pool. When the fence is exposed, the flow is almost non-existent throughout the system. The water can drop so low as to completely isolate the upstream and downstream sides of the pool, exposing the brownish sandy bottom, but in the furthest reaches of the cave, there is still a whisper of flow- indicating that not all of the water crosses through the karst window. 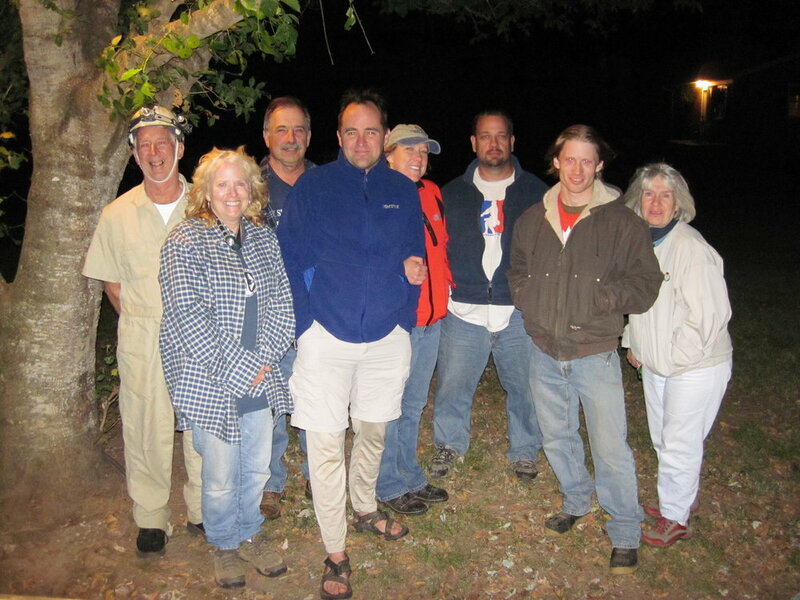 The exploration team consists of the usual few core Tennessee cave divers- Marbry Hardin, Chrissy Richards and Jason Richards, and on occasion, Donald "Skip" Kendrick from Middle Tennessee State University will join us on a dive. Marbry and Skip were responsible for laying the first line in the upstream cave, and explored the cave to approximately 1100 feet from the entrance, and sort of stalled there. Marbry was also involved in the early exploration of the downstream, and later participated in the unsurveyed connection of Military Spring with Jason Richards in April of 2010. Within days of the connection to military, rains pumped water into the cave system, visibility dropped to inches, and the cave became undiveable. The cave wouldn't clear again until late into September of 2010. The second week of September, Chrissy and Jason made exploratory dives into the cave. Though the visibility wasn't more than 5 feet, they traveled approximately 1000 feet upstream and pulled line out of the ever-shifting sand dune floors in preparation for more diving later in the month, should conditions continue to improve. By the 20th, the conditions were good enough for exploration, and Jason made the first solo exploration dive into the upstream, to try to extend the reaches of the cave. None of the upstream passage had been surveyed up to this point, so the mission for the dive was to survey to the end of the line, and if gas allowed, continue exploration. With a single stage bottle and sidemount 120s, Jason was able to survey the existing line and add 600 feet to the end, surveying on the way out. Continuing on the improving visibility, Jason made another solo dive upstream on the 30th of September. This time, taking two scooters and a single stage bottle, he was able to add 1700 feet of new line in one dive by scootering to the end of the old line. The cave up to this point had resembled a low sewer tunnel, consistently 15 to 18 feet wide and five to six feet tall, but on this dive, Jason would encounter the first large room in the cave. The room seemed so large, that he would first lay a line into a smaller passage trending to the left of the main passage. He laid approximately 50 feet of line in this passage, and then returned to the room to explore the larger passage to the right. This passage continued, and led to the second large room in the cave, which contained the "Spire," a large triangular chunk of chert which had broken off the ceiling and imbedded itself vertically in the floor. The poor visibility initially caused some confusion, but Jason chose the passage which seemed to have clearer water, and drifted upward into another sewer passage, this time at only 20 feet of depth. Enabled by the shallow depths, Jason was able to place and survey 1,760 feet of new line, leaving the end of the line at only 34 feet. The spire room would continue to be interesting, as the cave would make an almost 90 degree turn from its previous direction. The sudden change in depth made everyone think that there might be another shallow passage on the opposite side of the room. On the 10th of September, Jason would make one last dive before the cave would once again succumb to surface rain. Taking two scooters and two stages, he scootered to the end of the line, through the Spire Room, and into the shallow tunnel to begin laying new line. The shallow tunnel, slightly clearer than the rest of the cave, made exploration fairly easy, and Jason would eventually lay more than 2100 feet of line on this four hour dive. The passage changed from the familiar sewer tunnel to large, white walled vertical canyons approximately 1000 feet into the dive, reminiscent of the nearby Guy James cave. Unfortunately, this change in topography was paired with an increase in depth, and the shallow friendly cave would quickly turn into a deeper challenge, the end of the line tied off at a depth of 95 feet. The day after this dive, a large thunderstorm to the northwest of the cave would completely flush the visibility in the cave. When the team returned to dive the following weekend, they were greeted by a deep brown swirling siphon, the water howling across the karst window and into the downstream. The cave would remain dark for over a year and a half. The first indication that Cow Crap might be diveable this year was during one of my airplane training flights. I had some spare time, and decided to fly over some of our favorite caves and see how they were looking from the air. To my surprise, I could see the bottom of the basin at Cow Crap. Though I was unsure if it was the sun, or the unique perspective, it was time to check back into diving at the cave. Some new politics had happened while we were away. Skip informed us that they land where the cave resides may have been sold back to the State, but was likely no longer the property of MTSU, though this could not be confirmed. Meanwhile, Marbry drove over to the cave, and confirmed that our nemesis, the gear licking cows, had indeed been removed, as well as the fences, and someone had planted corn over the cow fields. He also told us that the pool looked fantastic. Chrissy and I immediately made plans to come down and dive. Though Chrissy and I had been spending significant time on our other project cave, Jasper Blue Spring, the opportunity to dive Cow Crap was not to be missed, as it was so rarely diveable. Chrissy and I decided that our first dive would have to be the downstream, to repair lines, and survey the passage from Military Spring back to the Karst Window. Technically misnamed, Military Spring is itself a karst window, with both and upstream and downstream entrance on the floor of a large cavern area- which in flood is completely submerged and flows out the entrance into a surface creek, hence the name. But on today's dive, the room would be half empty, showing its impressive dimensions, and beckoning with the as yet unfound downstream siphon passage. On the 1st of July 2012, Chrissy and I entered the downstream with a single stage, knowing that the connection was something around 1800 feet of passage, and at its deepest, only 60 feet deep. We spent a significant amount of time repairing line shredded by the high flows racing through the sharp siphon passage, and buried below shifting dunes. Eventually we emerged at the cavern room of Military Spring, surprised to see how large it was, as the last time I was there, Marbry and I had poked our heads out the small entrance hole, the water being almost 10 feet deeper, and we were completely unaware how large the room behind us was. Once in the room, Chrissy and I turned and began our survey out. With the survey of all existing lines finally complete, it was time to carry on with the exploration. On the 7th of July, Marbry, Chrissy and I got in the water with the intent of them going downstream to put line in suspected side passages (we had believed that Military Spring was not actually on the trunk passage, but a side passage) and I would go upstream with the rEVO rebreather to continue the exploration. One problem after another (I had forgotten the survey book, forgotten my drysuit socks, the mounting strap for the rebreather to my sidemount harness was STILL too short, and finally the offboard addition connector was leaking) caused me to call my dive at the surface, before it even got started. Marbry and Chrissy went on their dive as planned, and came back with the perplexing news that all of the places we had thought were side passages in the downstream were just larger areas of passage, and that all of the flow did indeed seem to go through the room at Military Spring. This was interesting news, but a little surprising, as both Marbry and I swore that we saw side passages at a couple of places in the passage. The unfortunate part was that without access to Military Spring (the landowner doesn't want divers) and most of the passage being fairly low and tight, scootering is probably unlikely, and the rebreather certainly wont fit. Through some miscommunication, Chrissy and Marbry turned the dive and never checked the rest of the Military Spring room, probably deciding to leave the virgin booty for me. On the 8th of July, I came back to try to make the upstream dive. I spent the rest of the day before making the three hour round trip to the house to make rebreather repairs and pick up the missing equipment, so that I would be prepared for diving on Sunday. Marbry met me the next morning at the spring at 7AM, in hopes of getting into the water prior to the sun cresting the trees around the sink and causing heat stroke while I put on my drysuit, heavy weight underwear and heated vest. I arrived early and got all of the gear into the water just as Marbry showed up to assist. He helped me gear up in the water, and soon after I started the long scooter commute through the cave. With the Viper scooter on medium speed, I quickly navigated the front of the cave with its lower visibility, and brown stained guide line disappearing amongst the thin horizontal layers of chert along the brown walls. The usually coarse grained sand floor had picked up a thin layer of silt that moved around every time I stopped to repair a placement, or pull the line up out of a sand dune. Soon, I was at the room with the downstream T in the line. I had forgotten about this T, laid almost a year and a half prior, and was initially confused by its presence. I decided that since I was there to survey, and I was unsure which one was the main line, I picked the left passage to check. I tied off the scooters at the T, and swam down the line. Of course it ended in about 50 feet, but to my surprise, I could see another line on the other wall of the same passage. I quickly surmised what had happened: In the lower visibility on my last dive here, I had thought that there were two passages, but in reality I had laid line down each wall of the same passage. I retreated to the T, marked it appropriately with line arrows, and collected my scooters. I continued to the Spire room, and considered checking the high shallow lead while I still had line, but opted to continue along the main line to see where it went instead, judging that the end was the more difficult lead to close. After an hour I reached the end of the line, to find that it had broken off the final tie-off. I found the line wrapped around a chunk of chert buried in the sand in the middle of the passage. After tyeing off a new reel to the end of the old line, I dropped the scooters at the new tieoff, adjusted the gas mix in the rebreather, and swam off into the virgin passage. The passage quickly reverted back from the nice vertically oriented canyons to the standard sewer tunnel, and continued nearly directly west. After about 20 minutes, piles of breakdown began to pile up in the center of the passage. The breakdown was strange, however, instead of large blocks, the breakdown consisted of large piles of thin flakes that had obviously fallen from the ceiling. Likely, this was caused by construction of the highway above the cave, which by this time, I was certainly under. As the breakdown got higher and higher, I began to worry that I might not be able to get past the breakdown, with the large rebreather on my back. Fortunately, I was able to weave back and forth from one side of the passage to the other and wind my way past the breakdown. On the far side, the passage continued again in the sewer tunnel type passage until I finally ran out of line in my second reel. Finding a large stick (from where?) I shoved the stick in the deep silt and made my final tieoff in the center of the passage, ready for the next exploration dive. Just a short cave, surveyed while waiting for Gerald Moni to do the "hard part." Sundown Spring Cave is nearby Jeter River Cave, but the entrance was so dangerous due to collapse that the cave never really developed in the same manner. In addition, due to shallow depths of the cave, the highway above caused multiple collapses in the cave. We explored and mapped a total of 888 feet. The final map, published to the Tennessee Cave Survey. On a cave diving search trip with Advanced Diver Magazine publisher Curt Bowen, we ran across Deep Rise Cave in Cannon County, TN. We explored the cave and found a large vertical shaft with a small passage at the bottom with a no mount restriction at 165 feet which led to 300 feet of cave..